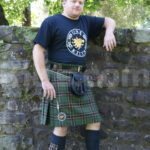 Each kilt is custom made so expect 6 – 10 weeks delivery. Rush delivery possible. 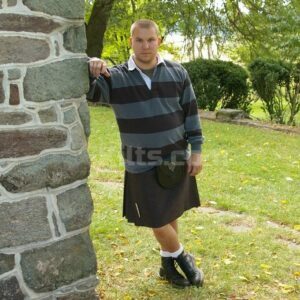 Our relaxed Casual Kilt is made in the US and is perfectly suited to the budget-minded kilt wearer. Available in over 100 tartans, we will create a kilt with your measurements and ideal tartan. It has unique “Low Pill” construction which is designed to prevent against pilling and is coated in a thin layer of Teflon to prevent against any staining. This makes the kilt hard wearing. Because of this, it is easy to iron. 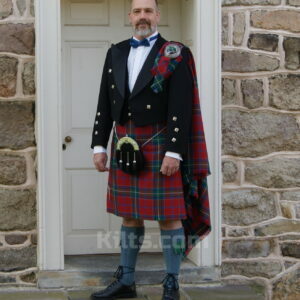 This kilt is suited for the first time kilt wearer who is a little nervous about ordering one of our higher end kilts. The kilt is ideal for informal occasions such as wearing it in the pub or with a casual shirt or t-shirt. Many of our customers wear it to sporting occasions. Before ordering your Casual Kilt, we would ask you to look over the kilt measuring instructions. Because each kilt ordered is made to measure to your exact requirements, we are not able to refund any purchases that make use of wrong measurements. – Made of PV material woven in the UK – 4 to 6 Yards of 12 oz. – Over one hundred different tartans available. – It can be washed in a washing machine, unlike a 100% woolen kilt. – Each kilt is made for you using your exact measurements. 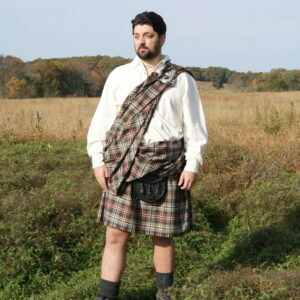 – There is an impressive “One thread margin of error” on the casual kilt and is lined up on the pleats for added style. – “Swing” is possible with the kilt due to the 4-6 yards of material used, but not as much as a 9 yard kilt. – The kilt is fitted with three belt loops for wearing a kilt belt.